2 boiler units, each capable of generating 39.15 t/h steam at 40 bar gauges and 400℃ with super heaters and economizers. 2 Mitsubishi-Martin stoker units, each with incineration capacity of 18.75t/h. Mitsubishi dry type flue gas treatment system using fabric filter. (Hcl removal efficiency minimum 93﹪). Condensing steam turbine with generating capacity of 16.3 MW (16.3MW). Completely distributed digital control and monitoring system-using microcomputers. 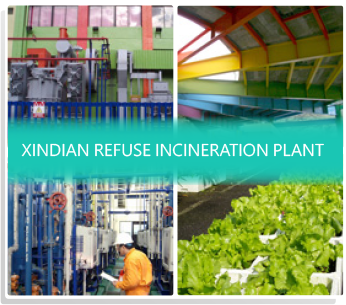 XinDian Refuse Incineration Plant is affiliated with New Taipei City Goverment→Environmental Protection Department, New Taipei City Goverment. 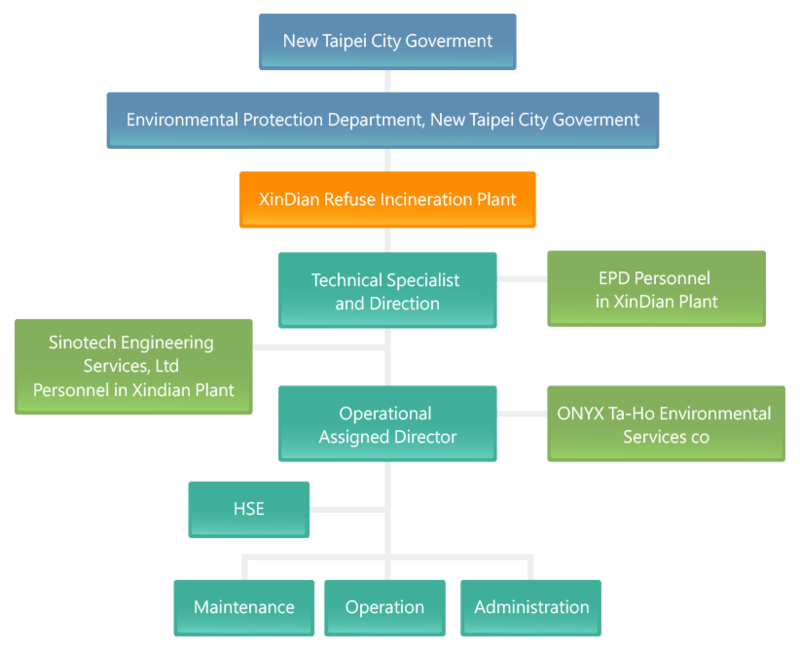 Under XinDian Refuse Incineration Plant, Technical Specialist and Direction, EPD Personnel in XinDian Plant→ Sinotech Engineering Consultants, Ltd Personnel in XinDian Plant→ Operational Assigned Director, ONYX Ta-Ho Environmental Services co→ HSE→ Mantenance, Operation, and Administration. Garbage is collected through the township cleaner team garbage truck → into the plant overground slag → to the garbage dump area → dump the garbage to the garbage storage pit. Crane control room personnel by operating the garbage crane and the bottom of the slag crane will be garbage into the incinerator burning → heat generated after burning heat waste heat recovery boiler to produce steam → to promote the turbine generator to generate electricity. After the end of the combustion, the formation of a stable state of the bottom of the residue, fly ash, reaction product material → through the conveyor to the factory bottom slag pit, fly ash storage tank, the reaction product storage tank temporary → cleared by permission of the waste The manufacturer shall be transported to the final disposal site for subsequent processing. 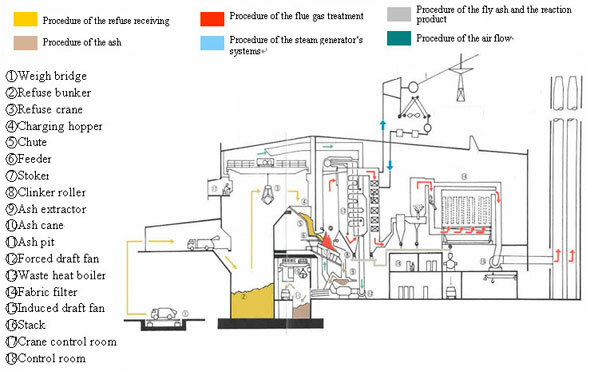 Waste gas from waste incineration → Treatment of the exhaust gas treatment facility set up by the factory → Gas that meets the emission standards to the entrance of the chimney → discharged at a high altitude of 150 degrees.